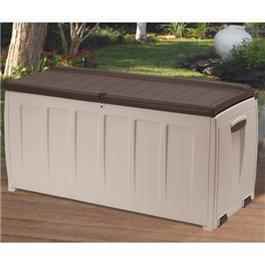 Garden Storage Box Light Brown Beige. This large heavy duty Keter Garden Storage Box with Seat – 340 Litre Capacity is ideal for storing garden cushions and pool supplies. The box can also double up as a garden seat for 2 adults. The box is completely water tight but still allows for ventilation. External Dimensions 125 W x 55 D x 61 H cm . Internal Dimensions 123.5 W x 53 D x 59 H cm . Packaging Measurements 120 W x 58 D x 21 H cm . Capacity 340 Litres . Manufactured by Keter UK.